Why do we get so anxious as adults when we here the forecast for snow? Our reasons for being anxious are legitimate. Childcare must be arranged, food shopping has to be done, emergency plans have to be made. We wonder if there will be work or school. Will we leave work early or will school have early dismissal? It’s a lot of stress on us as parents. When we were kids it was all so simple. We would be so excited as the first flakes fell. We would huddle around the radio in the morning waiting for the local AM radio station to announce our school closing. We didn’t get automated phone calls or text messages back then. As soon as we got the news we would head out to play. We would help Mom and Dad shovel the driveway. Mom would sometimes take us to the park. The township had a little pool of water they would freeze for us to skate on. They were happy times. I get pleasure now from hearing the excitement in our grandchildren’s voices. The older ones are excited that they have no school. They look forward to building a snow man and going snow board riding. The little ones look at the snow full of wonder. It’s something new for them to experience. I hope that whatever they do, it will give them memories that will last them a lifetime. 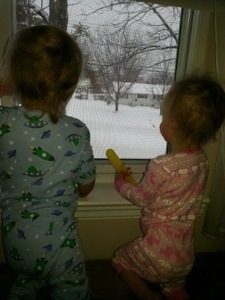 Aww… how cute are they looking out at the snow. Enjoy the snow!! It reminded me of my youth, sleigh riding and ice skating. You’re blogging now too?! Thanks for sharing! !